A fourth of India's steel production capacity is up for grabs. Which steel magnate will come on top and why does it matter? Mumbai: Can you set a price on ambition? Since the Insolvency and Bankruptcy Code (IBC) came into effect, 30 million tonnes (mt) of idle steel production capacity (about a fourth of India’s total capacity) has been ripe for the picking. If you are a steel magnate with an eye on the booming Indian market, how much will you pay to be the top dog? In this battle for supremacy in production capacity—the race to sell tonnes and tonnes of steel to an infrastructure-starved nation—can you set a price on ambition? Last week, the Supreme Court told the two top bidders for the 10mt Essar Steel plant that they would have to settle unpaid dues in related companies to qualify as bidders. For ArcelorMittal, that’s ₹ 7,000 crore. For Numetal, it’s at least ₹ 49,000 crore. To be sure, this is what the two rivals need to pony up just to qualify to bid for Essar Steel. The actual cost of acquisition is as yet unknown. The intensity of this battle has been visible in several court cases for several steel assets, with companies resorting to mud-slinging and litigating back and forth, reminding one of the great telecom war that was fought for survival two years ago. The steel battle is for dominance as much as it is for survival. A glimmer of that was visible on 14 September when in a letter to the resolution professional (RP), ArcelorMittal dug up the past of its rival bidder Vedanta Ltd, including the sensitive Thoothukudi plant issue, in a bid to present its case for the takeover of Essar Steel Ltd. ArcelorMittal portrayed Vedanta as guilty in specific areas such as environmental law violation in India, Zambia; illegal mining in Goa; disregard for safety standards; and to top them all—human rights violations. ArcelorMittal later retracted and wrote another letter to the RP asking it to ignore the previous letter. But, the damage was done. The first letter was lapped up quickly by the media and its impact was further magnified after Numetal, another contender for Essar Steel, shot off a separate letter to the RP, highlighting reasons why ArcelorMittal should be disqualified from the bidding process—thus making it a three-front battle. And, if you thought this battle is limited to these three companies in a sector that was mostly dead in this decade, then take a second and look around. Domestic rivals JSW Steel Ltd and Tata Steel Ltd have been nipping at each other’s heels in National Company Law Tribuanl (NCLT) bids. So, when Bhushan Steel Ltd came up for bidding, the Tatas submitted a bid of ₹ 24,000 crore initially, while JSW Steel came in with ₹ 29,700 crore. To the surprise of the Bhushan Steel’s lenders, its RP and JSW itself, the Tatas then revised their bid massively to ₹ 35,200 crore for the company’s 5.6 mt steel production capacity, the bulk of which is in Dhenkanal, Odisha. Tata Steel acquired Bhushan Steel in May this year. The Indian steel rush is a subset of an unfolding global game, with countries betting on growth and viewing steel as a strategic asset. US President Donald Trump recently erected steep tariffs in order to revive the domestic steel industry. China’s Belt and Road Initiative is, in part, an effort to shore up its steel sector, which is facing a series of closures due to mellowing economic growth and environmental concerns. Even going by conservative estimates, most analysts expect Indian steel consumption to grow by at least 6-7% every year as growth picks up. This growth will come even as India is attempting to protect its industry from cheaper imports, through a series of anti-dumping investigations. If the Indian government succeeds in doing what it wants to do, it would only enlarge the market for domestic steel. For the two most ambitious primary steel producers currently—JSW Steel and Tata Steel—the battle for supremacy is as much about cornering new capacity as it is about keeping the others out. For the newcomers, such as ArcelorMittal and Liberty House, it is about setting a foot into a market where steel demand is expected to surge, especially in the backdrop of slowing steel consumption in the world’s largest economy, China. “For players like JSW and Tata who want to boost capacity, it’s not only difficult to ignore a large existing integrated plant, but they also risk a rival getting there first," said Anand Bhageria, partner at Singhi Advisors that focuses on special situation acquisitions. “Steel is turning into one of the better success stories in NCLT for two reasons. One, because the big bankrupt companies here have set up world-class facilities and two, because steel prices have gone up in the last couple of years," Bhageria added. It is under these circumstances that nearly 30 million tonnes of steel-making capacity (worth over $30 billion) is currently sitting idle under bankruptcy proceedings, waiting to be picked up by the highest bidder. Creditors have a shot at getting repaid. And suitors see the potential purchases as a way to acquire a bigger share of a steel market that’s forecast to produce more than 100 mt this fiscal year. Even as the race to reach the top intensifies, ArcelorMittal’s bid for Essar Steel, promoted by the Ruia brothers, showed the price for being even the third-place contender in the unfolding steel wars is quite high. ArcelorMittal had to effectively value Essar Steel at roughly ₹ 5,000 crore for every 1 mt of production capacity, the highest any company has paid in India’s nascent bankruptcy court. Meanwhile, a relatively unknown Sanjeev Gupta of Liberty House has joined the race to get a piece of the cake. So, what prompted Tata Steel, which is struggling to set its European steel operations in order and has a debt overhang of over ₹ 69,000 crore, to pay through its nose for Bhushan Steel? Why is Sanjeev Gupta, who doesn’t have a past in India’s business circles, stationed in Mumbai? Why is Lakshmi Mittal-led ArcelorMittal so aggressive, especially since it focused on developed markets for decades to spruce up its revenues? The big question on everyone’s mind is: what happens to the Indian market when global steel magnate Mittal sets his foot in. Mint asked these questions to Tata Sons chairman N. Chandrasekaran at an informal dinner that he hosted for media at the inauguration of the revamped Bombay House—the group’s corporate headquarters. “India story...," Chandrasekaran said, with a pause only to add, “...is yet to play out." “I could add 20mt more to my capacity," he said about Tata Steel, which has an annual capacity of 13 mt in India, and 27.5mt globally. In September, Tata Steel beat JSW Steel, Vedanta and Liberty House to pick up the 1mt integrated specialty steel capacity of Kolkata-based Usha Martin Ltd, a power plant and a captive iron ore mine for ₹ 4,300-4,700 crore. While a minor acquisition for the steel giant, it boosts the company’s presence in wire and wire ropes, building capacity in value-added products. This, along with the acquisition of Bhushan Steel, has brought Tata Steel’s India capacity to 19.3mt, neck-and-neck with JSW Steel with an installed capacity of 19.5mt. Tata’s current aggression also hinges on its recent attempts to build up capacity internally in order to cater to a growing demand for steel from power and infrastructure companies. It had taken Tata Steel ₹ 25,000 crore and, more importantly, 10 years to build a 3mt greenfield steel plant in Kalinganagar, Odisha. In comparison, by buying out Bhushan Steel, Tata Steel managed to integrate close to twice that capacity in just a few months, that too, very close to its existing plant. A spokesperson for Tata Steel declined to answer questions for this report. However, at a press conference held in May, the company’s chief executive officer and managing director T.V. Narendran said that completing capacity expansion work at Kalinganagar from 3 to 8 mt per annum is still 3-4 years away. “The Bhushan Steel acquisition allows us to ramp up capacity immediately. In the Indian market, if we don’t add a million tonne a year, you can’t hold on to your market share because that’s how fast demand grows," Narendran had said. To be sure, Tata Steel’s acquisition of Bhushan Steel raised its net debt from ₹ 69,000 crore to ₹ 1.04 trillion. This will fall to ₹ 84,000 crore once Tata Steel manages to move ₹ 20,000 crore of debt off the books of its European subsidiary to the new joint venture with Thyssenkrupp. Bhageria of Singhi Advisors said the race to build steel capacity is driven by strong prospects for the infrastructure sector over the next decade, and infrastructure is primarily about steel and cement. “Players like Tata Steel and JSW Steel can ill-afford to let the other become the runaway leader," he said. That is why the stakes are sky high. “We have been saying that our internal benchmark for brownfield expansion is ₹ 3,500 crore/mt," Seshagiri Rao, joint managing director and group chief financial officer, JSW Steel, told Mint in a telephonic interview. “If that is the case, a 5mt steel plant cannot be bought for more than ₹ 18,000-20,000 crore. Our bid for Bhushan Steel had been over ₹ 29,000 crore, much above our benchmark. So we had been aggressive, just not as aggressive as our competition." “Considering the opportunities available today and given the time that greenfield expansion takes, we take such calls (on valuation)," Rao added. The bidding for these steel assets will also depend upon the iron ore reserves that these companies have, which means a company will bid big if it has the ore reserves to actually utilize the capacity that it acquires. “That is why Tata could bid so high for Bhushan Steel and JSW couldn’t," said an analyst with a foreign brokerage, requesting anonymity. “For Bhushan Power, even Tata doesn’t have excess iron ore reserves, and it will either need to get more mining approvals or buy iron ore in auctions. So both Tata and JSW have even chances in this case," the analyst added. 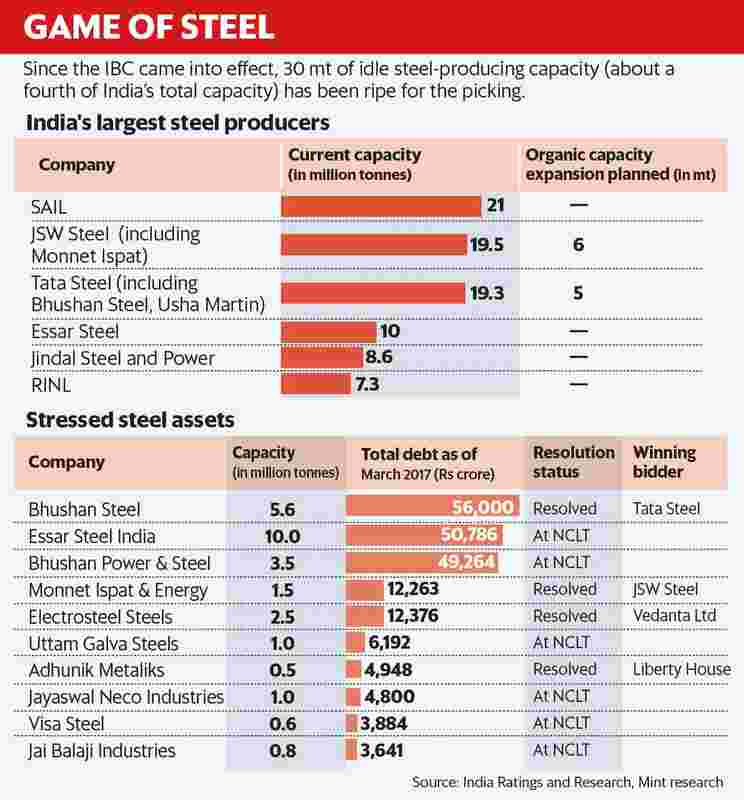 Steel Authority of India Ltd (SAIL), the public sector steel producer with the largest steel capacity, has been conspicuously absent in these bids. According to Mahaveer Shankarlal Jain, associate director, India Ratings, this is because of the company’s decade-long ₹ 64,000 crore capital expenditure programme that it has just completed. After nearly two years of losses, SAIL finally turned the corner in the December 2017 quarter by curbing costs and ruthlessly cutting headcount. “SAIL is in the last leg of balancing its plants to operate at full capacity, so it isn’t capable of taking on further risk, compared to JSW or Tata Steel. For SAIL, it’s the right move to keep out of the bidding process," Jain said. Over-leveraged Jindal Steel and Power Ltd, a company run by Naveen Jindal, has also stayed away. The other company that has so far maintained a low profile is Anil Agarwal-promoted Vedanta, which paid ₹ 5,320 crore for Electrosteel Steels Ltd, which has a steel production capacity of 1.5mt, and did not offer a comment when ArcelorMittal took on the firms’ past environmental track record. “Vedanta hasn’t been very clear on their strategy for steel in India," the analyst with the foreign brokerage firm said. “We know that if they want something, they chase it very aggressively. With Electrosteel Steels, it has a toehold in the Indian market. They might look at organic expansion from there, but it’s too soon to tell." While the fate of most of the assets undergoing the bankruptcy process remains sealed, largely due to litigation, it is already clear that the outcome of this mechanism will redefine the way business will be done. The consolidated steel sector may become far more transparent and competitive too. But for now, it’s a mad dash for spoils with an uncertain end.